A backpack with classic style that also offers secure storage for towing your gear to and from the course. 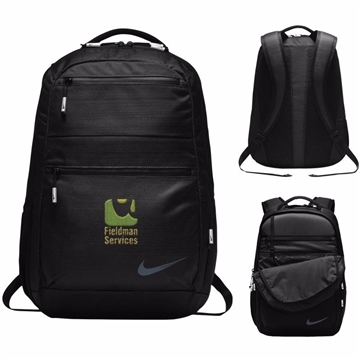 Ten functional pockets provide organization options while the ventilated die-cut air mesh back pad and Nike Max Air™ curved strap system allow for comfortable carrying. this is a great product for a business to hand out to your customers! Veronica is my contact and has been thoroughly helpful with my orders. The product is a superb value, a lot of products with this logo design all within an easy transporting situation! Your system is very efficient. It's just cute. No complaints. These were a hit.